146,47% was the total sum of the support for the political parties in the region of Rostov-on-Don in the south if Russia, as it was presented by Rossiya 24 in 2011. A new whistleblower has now emerged from inside a Russian state media organization. This time it is Leonid Krivenkov, a former camera operator on the state TV channel Rossiya 24, who in an interview tells RFE/RL about how the propaganda output is managed by his ex-employer. The testimony offers insights into the daily work of the Kremlin-controlled media machinery – on top of adding new knowledge about one particular Kremlin propaganda classic. Back in 2011, the official outcome of the elections to Russia’s parliament, the State Duma, was questioned by many Russians, some of whom even took to the streets with protests. And Russian state TV only added fuel to this fire when it announced results in some of Russia’s regions, which added up to more than 100%. More precisely, 146%. This was the total sum of the support for the political parties in the region of Rostov-on-Don in the south if Russia, as it was presented by Rossiya 24 in 2011 (see the screenshot above). 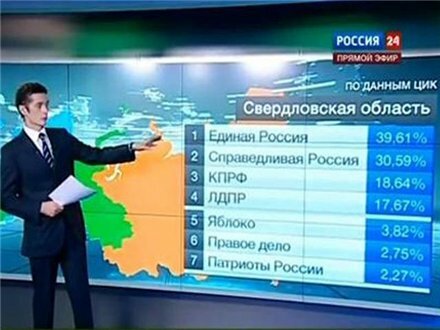 In the Russian region of Sverdlovsk Oblast, Rossiya 24 presented the 2011 election result just above 115%. In the interview, the former camera operator also explains how many employees at the state TV channel are fully aware of their lying and even joke about it, for example by saying, “your turn to lie” on the internal communication channels before switching over to a colleague. But we also learn about how negative economic incentive is used to secure observance of the propaganda rules from the employees: According to Mr. Krivenkov, the formal salary offered by VGTRK is extremely low, and most of the real salary is paid as bonuses – which can be withdrawn if employees deviate from the propaganda line. Rossiya 24 is a part of the radio and TV broadcasting company VGTRK; a state structure which also controls a number of other TV and radio channels, including Rossiya 1 TV. Leonid Krivenkov’s testimony echoes similar stories told by previous whistleblowers, notably that of Dmitry Skorobutov, who revealed details about Kremlin control on Rossiya 1, including written versions of the so-called “temniki” guidelines used by editors to not cross the red lines. And the incident with the 146% does also not stand alone. It has inscribed itself in the series of cases when human mistakes make cracks appear in the surface of the disinformation output. The interview with Mr. Krivenkov was first broadcast in Russian on radio, but later published online in English by RFE/RL. For examples of disinformation broadcast Rossiya 24 or its sister channel, Rossiya 1, follow this link to the EUvsDisinfo database.